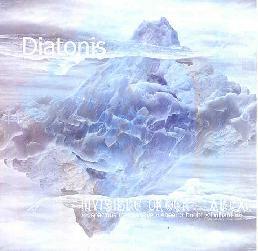 Diatonis - "The Endless Knot" / "Invisible Order AI.CX." Diatonis is the moniker used by California based musician Stuart White. I see 7 releases to date on the Diatonis web site, and reading about them it seems that White is primarily an ambient space musician, although The Endless Knot CD includes a variety of ethnic percussion instruments, gongs, Tibetan and Pan flutes, and bass. The press letter that accompanied these CDs note that some have said The Endless Knot sounds like King Crimson without the guitars. I can easily hear where people might say this in reference to the tracks "Klab Cros Templi" and "The Endless Knot", although this is too simplistic a description. "Klab Cros Templi" includes a deep thudding bass that sounds like it's right out of the earliest Bill Laswell Material days, combined with a cacophony of bells and other block-like percussion. Spacey keys provide the drifting melodic atmospherics. Structurally I can see why some think of King Crimson, but I'm even more reminded of the Finnish band Circle that we've so often written about in Aural Innovations. And I dig the howling drones and pounding repetitive grooves around which White subtly develops the music. The title track is where the King Crimson references are strongest. Low drones and flute set a dark ambient tone, but then the song launches into something that sounds remarkably like "Thrak", albeit White's unique take on the Crimson sound. More of that heavy pounding Laswell bass and varied percussion are led by ethnic flutes, spacey ambient waves, and numerous other sounds. An intriguing mixture of King Crimson and Circle with ethnic world influences. "Offering" opens with slowly pounding percussion, the scene it creates feeling somewhat tribal, but also dark and foreboding. Waves of murmuring and wailing atmospherics state the main themes, the entire piece functioning as a subtle but interesting blend of ambient and percussion music. "Unlock The World" is an intense percussion symphony, again incorporating ambient elements to give the music a dark atmospheric feel. There are also similarities to "Klab Cros Templi", mostly the repetitive percussion patterns that evolve slowly, and there are also horn sounds near the end that give the music a droney melodic feel. "Meditation", "Eight Thousand Verses", and "Turning Tide" are the more purely ambient tracks on the CD. "Meditation" is just what the title says. Ten minutes of bells and whispy, but heavenly ambient waves that serve as the listeners mantra. For "Eight Thousand Verses", tribal percussion, gongs, drones, and chanting voices are all part of a larger, slowly evolving ambient journey. Like a more percussion-heavy version of "Meditation". Here too we have droning mantras we can focus on, the chants and flute waves providing higher levels of consciousness for this spiritually cosmic trip. 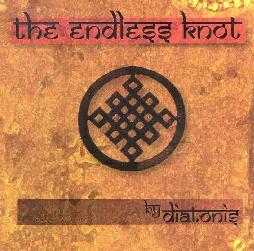 Whereas the Diatonis web site specifies that The Endless Knot was recorded in real-time using no loops, Invisible Order AI.CX is the complete opposite, consisting of purely ambient electronic music and claiming it's main technique being the loops system used by Brian Eno. It's a fine set of space ambient tracks, with repetitive loop patterns of varying colors and textures. The mechanical, quirkiness produced by the loops is often combined with more linear designs, making for an interesting effect that was continually knocking my focus out of whack. "At Sea" and "Perfection" include some spoken word with a bit of a Shakespearean sound. Like the Eno music this was influenced by, the building and merging of the loops sees the pieces take on a life of their own, the listener swept along as the music slowly evolves. The one real stand-out track on the CD is "Night Full Of Stars", probably the most complex, multi-textured piece of music on the album. There's an Eno meets Phillip Glass feel on the track in which ambient and minimalism seem to cross paths. As the 10 minute track evolves, the music takes on a deeper droning, but symphonic quality as the repetitive patterns continue, but slowly sink into the background. An exquisite piece that is far and away the best ambient track on either of these CDs. In summary, I enjoyed Diatonis' ambient music, though it was the fuller and more varied tracks on The Endless Knot that really turned me on. I can see a variety of audiences being interested in that one, from prog rockers to ambient fans into world music. I should also note that the Mp3.com DAM version of Invisible Order I reviewed seems to be different from the version described on the Diatonis web site. The version I reviewed has 5 tracks, only 3 of which appear on the 7 track version (apparently "full" version) described on the Diatonis web site. For more information you can visit the Diatonis web site at: http://www.diatonis.com/. There are TONS of sounds files to be heard at the Diatonis Mp3.com web site at: http://www.mp3.com/diatonis.